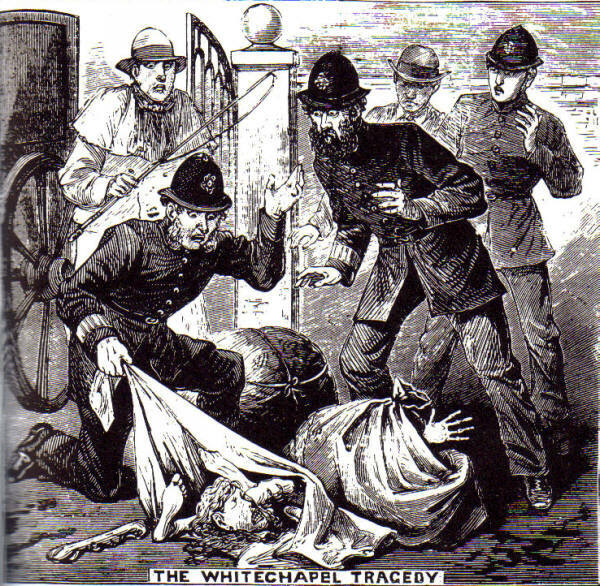 On this date in 1875, Whitechapel’s most notorious murderer ere Jack the Ripper arrived on the scene paid for his double life on the gallows of Newgate. 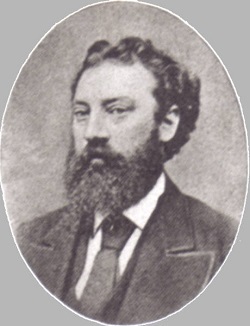 Henry Wainwright, brushmaker and philanderer, came to his mortal ruin by way of a financial one. The expansive Wainwright could not confine his adventures to actresses at the theater adjacent his Whitechapel Road shop* but in 1872 installed a mistress, one Harriet Lane, in a flat of her own with a liberal £5-a-week stipend. “Mrs. King”, as she styled herself with a better ear for the forgettable name than Wainwright would evidence (we’ll come to that part), bore her lover two children. But by the next year, Wainwright’s prodigalities and a worldwide economic crisis had sunk him in debt. As his creditors circled, Wainwright pinched farthings where he could, putting predictable strain on his lover’s allowance — and with it, her affection, her sobriety, and her discretion. As Wainwright succumbed to bankruptcy, Harriet Lane’s demands for money and occasional drunken forays into his very place of business had Wainwright scrambling for some way to fob the mistress off on some other man. His efforts thereto were frustrated, so he contrived the next best thing: prevailing on his brother Thomas** to write his mistress mash notes under the ungainly pseudonym of “Edward Frieake”, Wainwright spun a plausible scenario for her elopement. Unfortunately for Mrs. King, the honeymoon would be a chloride of lime pit under the floorboards of Wainwright’s warehouse. On September 11, 1874, the lady sallied out of her apartment, and was never heard from again. Laborers working near Wainwright’s warehouse that night would report hearing three gunshots, but being unable to pinpoint their source they let the matter drop — just as did police with Harriett Lane’s disappearance. With the help of a chaser letter or two from his brother, Wainwright represented that she had run off to Paris with her correspondent. Why, she might never be heard from again! Another year on, Wainwright had good cause to believe he’d gotten away with the whole thing.† But his finances having finally collapsed, the warehouse that doubled has Harriet Lane’s tomb had been foreclosed upon in July of 1875, and it would soon be sold to new and potentially nosy owners. Wainwright had a body to move. And when the hole was opened up on September 10, 1875, it uncovered not a few scraps of a satisfyingly dissolved corpse — but the body entire, preserved rather than eroded by its chemical bath. And the corpse stank disgustingly. 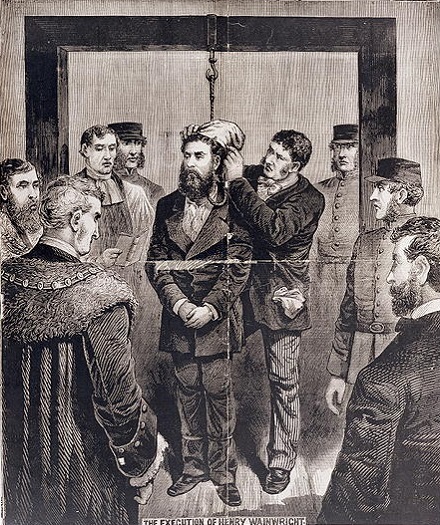 Showing the extraordinary judgment that had got him into this mess in the first place, Wainwright bought a spade and a cleaver to dismember the foul limbs he had once made love to, and then engaged a colleague to help him schlep the resulting packages out to the street. Arthur Stokes would later attribute his decision to peek to a divine command that struck him from the firmament, but nothing more remarkable than below-average curiosity will be required of a man encumbered by a heavy, fetid parcel to wonder what they might contain. 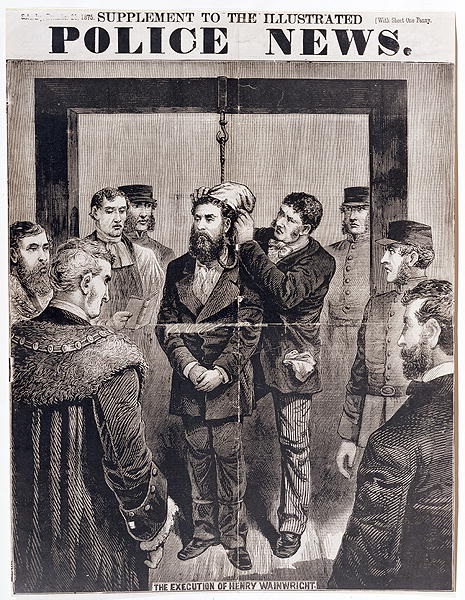 A more impressive explanation will be required to justify Henry Wainwright’s decision to leave Stokes alone with the horrors while Wainwright jogged off to hail a cab. Thinking fast for a man come face to face with a severed head, Stokes rewrapped the horrendous bundle and casually helped his homicidal friend pack it all onto the cab. When Wainwright drove off, Stokes trailed him, looking for constables to summon. And when he found them, and they approached the cab asking to inspect his cargo, all Henry Wainwright’s nauseating hypocrisy spilled out on the street in a lurid pile. 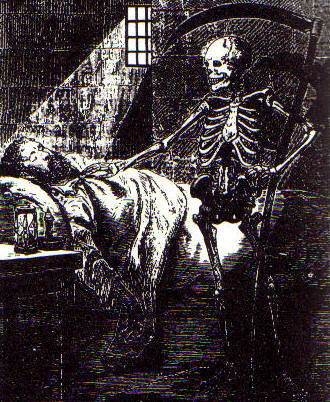 He lamely tried to bribe the constables two hundred quid to ignore the putrid sackful of human remains. So notorious was Wainwright’s crime that a vast concourse of gawkers mobbed the exterior of Newgate on the morning of his hanging, just like in the bad old days — even though, all executions by this late date being private affairs, these masses had no opportunity to glimpse anything save the black flag hoisted over Newgate to signal that the sentence of the law had been carried into effect. * Wainwright’s old shop apparently still stands, in relatively good condition. There are some 21st century photos of it and some interesting discussion of the case on casebook.org. ** Exactly when Thomas Wainwright became aware of what his brother had been up to with this “Edward Frieake” stuff is not certain. He did help his brother open Harriet Lane’s lime grave prior to its catastrophic attempted move. Tried for his life alongside his brother, Thomas was acquitted of capital murder but caught a seven-year prison sentence as an accessory after the fact. † The illegitimate children were in the care of a dressmaker, Ellen Wilmore, who still had them by the time of Wainwright’s trial. (Wilmore was called to testify.) It is not known what became of them thereafter. ‡ We are indebted to Foul Deeds and Suspicious Deaths in London’s East End for this outstanding detail: librettist W.S. Gilbert appears as a part of Wainwright’s defense. Gilbert, a barrister by training who had just made his big breakthrough by writing the 1875 musical theater hit Trial by Jury, was in the process of launching the collaborative career that puts Gilbert and Sullivan productions on community playhouse stages down to the present day. Late in 1875, W.S. Gilbert received a jury summons highly inconvenient to his burgeoning artistic career. Consequently, he managed to finagle for himself a nominal assignment on the Wainwright defense team as a means of re-establishing “practicing attorney” bona fides that would exempt him from any jury boxes.